Skoda will debut the CitiJet concept car at the Goodwood Festival of Speed this weekend. 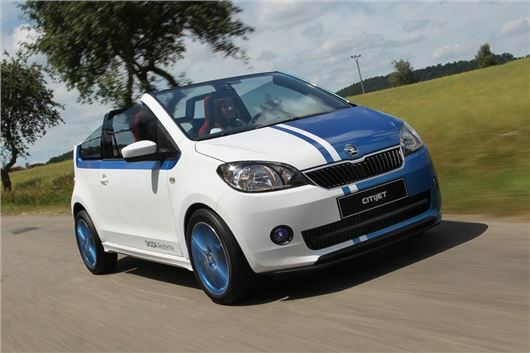 The open-top version of the Citigo will be shown for the first time in the UK, although sadly there are no plans to put the car into production. It's not the first time we've seen a concept based on the Citigo platform. When the Volkswagen Up was first launched there were a host of concepts based on the small hatchback, including the Buggy Up, an open top two-seater beach buggy inspired design. The CitiJet is the work of 16 Skoda apprentices from the firm's headquarters in the Czech Republic. It comes with a blue and white two-tone paint job, 16-inch alloy wheels and a hand crafted rear spoiler. Inside there's bespoke seat trim, red stitching and a white and red dash panel. Alongside the CitiJet, Skoda will be majoring on a two-wheeled theme to celebrate the brand's cycling heritage. This includes Skoda's range of bicycles, which can be ordered via the Skoda website. The range of cycles includes childrens bikes, mountain bikes and road bikes with prices starting from £270. Skoda will also be present on the Forest Rally Stage with the Fabia S2000.